The islands were part of the UK's Jamaican colony until 1962, when they assumed the status of a separate crown colony upon Jamaica's independence. The governor of The Bahamas oversaw affairs from 1965 to 1973. With Bahamian independence, the islands received a separate governor in 1973. Although independence was agreed upon for 1982, the policy was reversed and the islands are presently a British overseas territory. 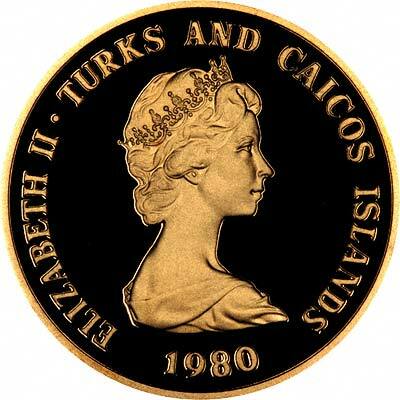 Turks and Caicos issued its own coins for the first time only in 1974. Only commemorative coins appear to be issued as the US dollar is used as the normal circulation currency. A Turks and Caicos crown is equivalent to one US dollar. We usually have in stock at least a few Turks and Caicos coins. The mintage figures tend to be quite low, although perhaps this is to expected with a population of about 19,350. 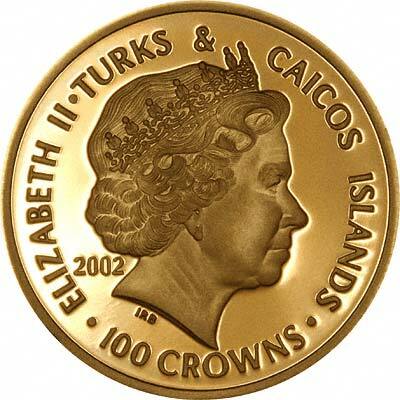 All Turks and Caicos Islands gold coins are commemoratives. Traditionally, most gold coins were produced in high purity alloys, often around 96%. Over the past few hundred years, two main standards have emerged for circulation coins, 90% fine, and 91.66% fine (22 carat), these standards combined durability with resistance to tarnishing. 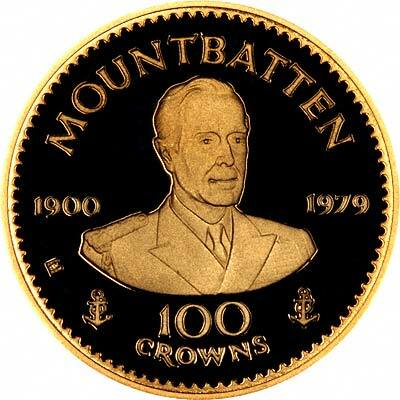 In very recent years, a number of "fine" gold bullion and collectors coins have been issued, ranging from 99.9% to 99.999% fine, although these highly pure gold coins would be too soft for durability in circulation. In the past few decades, a number of gold coins, made to sell to collectors, and as souvenirs and commemoratives, have been made from lower gold alloys, such as 18 carat (75%), 14 carat (58.33), 12 carat (50%), and even 9 carat (37.5%)! Obviously, these low carat coins have been produced because marketing departments have wanted a low cost product to fill a market gap, or to maximise their sales and profits. Fro our tone, you may correctly gather that we do not agree with this practice, however we do not make the coins, and in most cases, with a few exceptions) do not market newly released coins, we simply provide a market marking service for them in the secondary market. 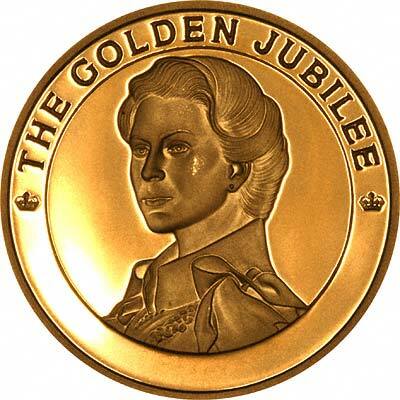 The 1997 25 Crowns is rather misleadingly described on its certificate (issued by Westminster) as a '1/4 oz Gold Proof Coin'. We weighed it as 7.75 grams* which in itself is a slight negative tolerance, but as the coin is only made of 14 carat gold, the actual fine gold content is only 0.1453 troy ounces or closer to 1/7th of an ounce. Are we being slightly picky, or are some coin marketers and promoters doing a Phineas T Barnum on their customers? We nearly forgot to mention this is a Golden Wedding issue. 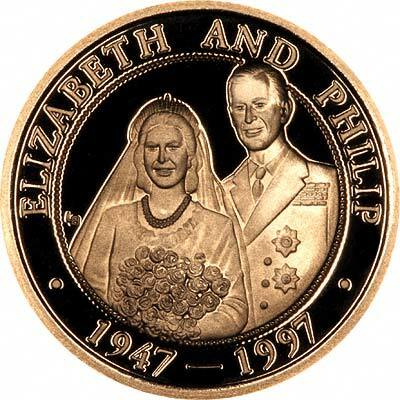 As the portraiture is less than wonderful, we thought at first it was a Charles & Camilla coin until we looked at the dates! * We decided to double check this weight. By using our diamond carat scales, which will weigh accurately to 1/1000th of a carat (=1/5,000 grams), and are happy to report that it passed, weighing 39.164 metric carats = 7.8328 grams = 0.25183 troy ounces. While writing the paragraphs above about the 14 carat gold coin, we realised we should add a page about low carat gold alloy coins. 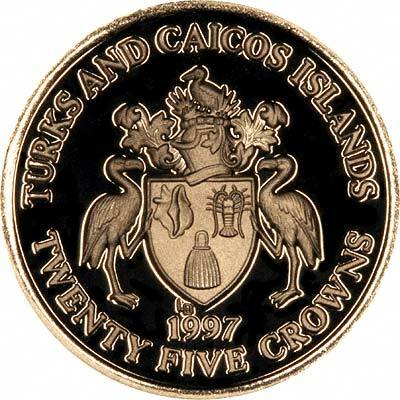 For silver and base metal coins of Turks and Caicos, please look at our original Chard Coins website.